The Association of Accredited Small Business Consultants® is the only global association specializing in training and certification of small business and SME consultants. Our proprietary educational materials and practice aides are specifically designed to develop proficiency in this area of consulting. An Accredited Small Business Consultant® or Accredited SME Consultant (designation for international members) has the knowledge and credibility to assist clients in improving operational efficiency leading to increased profitability and business value. QWhy was the AASBC formed? The Association of Accredited Small Business Consultants (AASBC) is a global association that was formed in response to the impact privately owned, small businesses and SMEs have on the worldwide economy. The core training of the AASBC is the SEMP Approach: Simplified Examination to Maximize Profit training book and a 40 video SEMP Approach lecture series. The objective of the SEMP Approach is to increase operational efficiency and maximize profit for small businesses and SMEs. QWhat is the ASBC® and ASMEC™ certifications? The Accredited Small Business Consultant® (ASBC) and Accredited SME Consultant (ASMEC...designation for international members) certifications are awarded to individuals who successfully pass the certification exam. It demonstrates knowledge in the area of small business and SME consulting necessary to assist clients in improving operational performance and achieving higher profits. QHow is the exam administered? The ASBC/ASMEC exam is intended to test knowledge of the fundamental skills required to adequately undertake small business and SME consulting engagements. The certification exam consists of a timed 125-question multiple choice exam taken on your own computer. Once the exam is started, it may not be stopped and then restarted. (1) If a member does not pass the certification exam on the first attempt, the exam may be repeated any time after a 24-hour waiting period from the time the first exam was completed. (2) If a member does not pass the certification exam on the second attempt, there will be a 30-day waiting period before the exam may be repeated. (3) After the 30-day waiting period, the member will again be given access to two exams. If not passed within two attempts, another 30-day exam restriction will be imposed. These restrictions ensure that members study the SEMP Approach material and not use the exam as a study guide or simply repeat the exam numerous times with the hope of eventually passing without having a firm comprehension of the material, therefore, enhancing the credibility of the AASBC® certification. QWhat is the best way to study for the certification exam? The SEMP Approach 400-page training book and 40-video SEMP Approach lecture series provide you with the necessary learning tools that will enable you to pass the exam. All of the questions are derived from the training book and 40 video lecture series. You should be able to pass the exam by seriously studying the materials and watching the SEMP Approach video lecture series. QDoes the AASBC have continuing education requirements? Currently, the AASBC does not require continuing education in order to maintain the ASBC or ASMEC certification. The AASBC recognizes the importance of keeping current on best practices in the field of small business and SME consulting and encourages all members, regardless of accreditation status, to stay up-to-date on current issues and trends. Due to the wide diversity of small and SME businesses, industries, organizational structures, and financial frameworks, the AASBC has elected to promote continuing education through the voluntary support of each member in the continuing pursuit of excellence and comprehension related to small business and SME consulting. The AASBC recommends expanding small business and SME consulting skills and knowledge through continuous study of newsletters, special reports, consulting tips, manual revisions, journal articles, and other sources of information that lend value to a member’s specific clients and specific situations. QWhy should I join the AASBC? 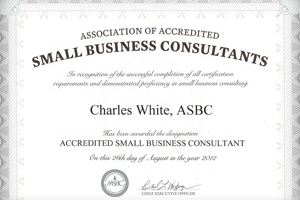 Joining the AASBC allows you to learn how to become a small business or SME consultant...and become a certified member! Benefits include (1) the SEMP Approach training book in printed and digital versions and a 40 video SEMP Approach lecture series (all you need to prepare for the certification exam), (2) monthly e-newsletters that can be used for client distribution, (3) downloadable checklists, client intake form, and special reports, (4) professionally prepared PowerPoint presentations for marketing your consulting practice, (5) member forum to communicate with like-minded professionals​, and (6) more...all designed to help build your consulting practice as an Accredited Small Business Consultant or Accredited SME Consultant (designation for international members)! Plus, your membership and certification allows you to (1) add additional revenue streams to your already existing or new business as opportunities open for you as an Accredited Small Business Consultant or Accredited SME Consultant, (2) create long-lasting relationships with clients, and (3) distinguish yourself from others based on your small business and SME consulting expertise. QHow do I join the AASBC? You can click here to apply directly online or download the application and remit payment to our main office in Austin, Texas. QHow much are the membership dues and exam fees? The initial, all-inclusive membership fee is $499.00 that includes the 400-page SEMP Approach training book, 40 video SEMP Approach lecture series, eligibility to take the basic certification exam, certification after successful passing of the basic exam, and other benefits of memberships (no other fees). Annual renewal dues are $149.00. Memberships are automatically renewed each year; however, you my cancel your membership at any time by simply going into the “My AASBC” section of the website and clicking the “Cancel Membership” button. QMay I join the AASBC without taking the certification exam? Yes, it is your choice whether you want to take the certification exam; however, the Association strongly encourages all members to learn the material and take the exam to become an Accredited Small Business Consultant or Accredited SME Consultant (designation for international members). This will demonstrate your knowledge and achievement to others, which will be a great assistance in building your small business or SME consulting practice. QIs there a time limit to completing the certification once I join? No. The certification exam may be taken at any time as long as you are a member in good standing and your membership is current. We do encourage members to study and take the certification exam as soon as possible to start reaping the rewards of this professional designation. QHow do I pay membership dues? Dues may be paid online with a credit/debit card or a check mailed to our main office in Austin, Texas. We accept all major credit cards through our online, secure system. On rare occasions (mostly with international members) a credit card payment will be declined. This is usually due to the issuing bank needing verification from the card holder that the transaction is legitimate and approved. If this should happen to you, please call your credit card company requesting that the transaction be allowed. QAfter I join, how do I receive the benefits of membership? Once you join, the SEMP Approach training book will be shipped directly to you. You will also have immediate access to a downloadable PDF version of the training book, 40 video SEMP Approach lecture series, all downloadable documents, checklists, newsletters, professionally prepared PowerPoint presentations for marketing, and other archived materials. Upon passing the certification exam, you will then have access to the accreditation seal of the AASBC to use on business cards, stationery, websites, and other promotional materials. QHow is the AASBC different from other business organizations? The AASBC is the only international association specifically organized to promote proficiency in small business and SME consulting and the awarding of the Accredited Small Business Consultant and Accredited SME Consultant (designation for international members). It is designed to be affordable to anyone interested in improving his or her knowledge in small business and SME consulting. 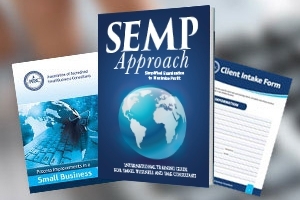 The SEMP Approach training book focuses on all areas of a small and SME businesses and can compliment the knowledge and experience you already have or enable you to enter a new professional field. QI am not a resident of the United States. Is the pricing policy the same? Membership fees are the same for U.S. or international residents (charged in U.S. dollars). There is, however, a $59.99 priority shipping charge added for all international members. QI want to become an international member. How do I join? Joining is an easy, online process by going to the following link https://www.aasbc.com/join-now and paying with a credit or debit card. Charges will be in U.S. dollars. Immediately upon joining, you will have full access to all member benefits including a downloadable PDF version of the SEMP Approach training book, 40-video lecture series, etc. The printed book will be shipped via priority international shipping. There is a $59.99 priority shipping charge added for all international members. QI am an independent business owner. Can I join the AASBC? You can definitely join the AASBC. We have many business owners as members who want to learn all the core competencies necessary to improve operations and maximize profits in their own businesses. This wide diversity of business knowledge not only assists owners with practical applications to implement immediately, but it also prepares them to work more closely with an experienced business consultant if the need arises. QIf I am not satisfied with my membership, may I cancel and obtain a refund? If you are not 100% satisfied with the AASBC’s SEMP Approach training manual or benefits of membership, you may return the training manual to us within 30 days, provided it is in excellent condition, for a full refund of your membership fee minus the cost of shipping the training manual. QIf I forget my username and password, how can I retrieve the information so I can login to my account? Click here to have your login information provided to you. We will use the email address on file. If your email has changed, please contact Member Services for your login information.